One of the most-marvelous creatures that exhibits the ability of life to adapt to its surroundings is the Galapagos penguin. The Galapagos penguin is the most-northerly of all penguins, being native to the Galapagos Islands of Fernandina and Isabela. They are the smallest warm-weather penguins, standing about 40 to 45 cm high and weighing in at about 2 to 2.5 kg. This little penguin has a black head and topside, with a thin white line extending from the throat to the corner of the eye. They are white underneath, with two black bands extending across the breast. The Galapagos penguin has a long, skinny bill that is black on the upper part and the tip of the lower part. The rest of the bill and a bare surrounding patch is pinkish yellow. 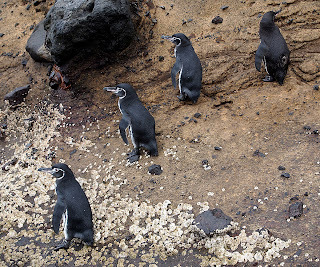 The female Galapagos penguin is usually smaller than the male. Juveniles have a dark head, and lack the dark bands across the breast that the adults have. These penguins are excellent divers. To reduce their buoyancy they only breathe in what they think they will need. They are 10 times better at storing oxygen in their muscles than other birds and can also store huge amounts of oxygen in their bloodstream. As they deplete this oxygen their unique blood chemistry avoids the acidic buildup that other animals would experience, which in turn lets them avoid muscle fatigue. Life near the equator is challenging for these birds. Penguins have many adaptations for surviving in very cold water. Insulating feathers, a thick, underlying layer of fat, and specialized blood heat exchange makes it difficult for them to deal with the tropical heat when on land. To survive the heat, they have evolved with special anatomical and behavioral adaptations. Their small size helps them to dissipate heat when on land. They also have shorter feathers than other penguin species which also makes heat loss easier. Galapagos penguins seek out shade when on land. They are able to dissipate heat by increasing the blood flow to their flippers, feet, and face. They have proportionately-larger flippers than Antarctic penguins, increasing the surface area for heat exchange. They are able to direct blood flow and bypass their heat-transfer system when in cold water. 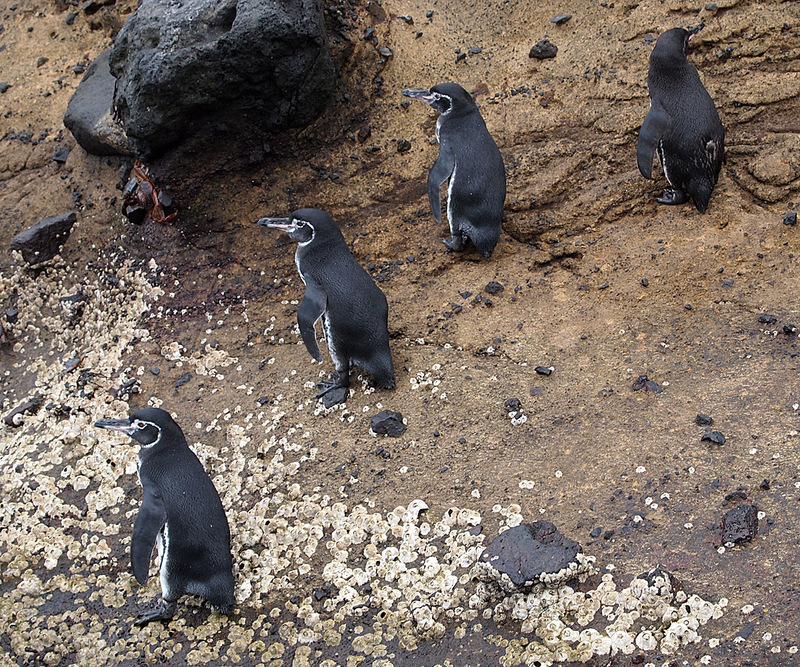 The Galapagos penguin has a very small breeding range and is the only penguin that lives entirely within the tropics. They prefer to breed in rock crevices, caves, or lava tubes that shade them and their chicks. They feed near shore in the cool, nutrient-rich Cromwell current, where there is an abundance of prey year-round. During El Niño years the current does not upwell and their population suffers as a result. The Galapagos penguin is considered endangered with numbers ranging from 1,000 to 1,500 individuals.